What is a Closed Course? 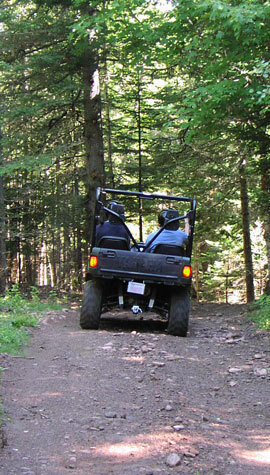 In December 2005 the Province of Nova Scotia introduced new laws regarding the operation of Off-highway Vehicles (OHVs). One notable change includes the development of closed courses. These closed courses are designed to ensure that youth who operate OHVs are doing so in a safe and controlled environment. a closed course is a facility which is designed and managed to provide a safe, controlled environment where trained OHV users 6 years of age and older can ride OHVs. Courses have controlled entrance and exit points and one-way traffic patterns. All other potential access points are gated or managed to limit the access by other motor vehicles registered pursuant to the Motor Vehicle Act. Access will also be limited for non-motorized users. A trained official and a trained first responder will be present and accessible to users. There are two categories of closed courses. Category A - provides competitive sport OHV users with a safe and controlled course designed specifically for their particular needs and class of OHV. These courses are sanctioned by the Canadian Motosport Racing Club (CMRC) or the Canadian Motorcycle Association (CMA) to ensure proper design elements and safety measures are in place. These organizations oversee competitive events for off-highway motorcycles, all-terrain vehicles (ATVs) and snowmobiles. Category B provides non-competitive and family-oriented OHV users with a place where they can safely ride together on recreational trails designed and rated with varying skill levels in mind. 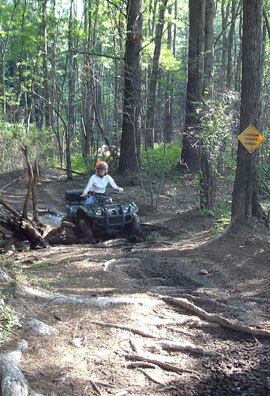 Closed courses are particularly important for ATV riders aged 6 to 13 as this is the only place they can ride in Nova Scotia. ATV riders aged 14 to 15, and youth who ride other forms of OHVs do have alternative riding options but they are strongly encouraged to ride on closed courses where greater safety measures and emergency responders are in place. OHV riders aged 6 to 15 who can demonstrate an exemplary level of skill and safety awareness to a trained closed course official may be upgraded from a green trail to a higher level of difficulty. Parents must approve this upgrade and provide constant supervision of their child while on the course. No child under the age of 6 can drive on a closed course. Youth aged 6 to 15 must be in site of a trained parent or legal guardian (parent of legal guardian can also designate a trained official or other responsible adult 19 or over to supervise their child on their behalf). Youth aged 6 to 15 must be on OHVs of an appropriate size, in accordance with the Off-highway Vehicles Act and its regulations. As per the schedule outlined in the Off-highway Vehicles Safety and Training Regulations, all users who should be trained must be trained before using the course. Approved helmets (DOT, CSA, SNELL, or BSI) must be worn at all times when riding. Additional protective equipment including eye protection, long pants, long sleeves, gloves and boots are required for riders aged 15 and under and are highly recommended for all OHV users. Chest, elbow, leg and other protective equipment is optional but may be deemed necessary by course operators. Users must follow all course rules of operation. All users of a closed course must have their OHVs registered. Effective April 1, 2007 all machines must have 3rd party liability insurance coverage for an amount that will be provided in the regulations. An operator may decide to have 3rd party liability insurance as a prerequisite to use their closed course before April 1, 2007. No vehicle that has an exhaust system other than that provided by the manufacturer or equivalent standard if replaced is allowed on a closed course. 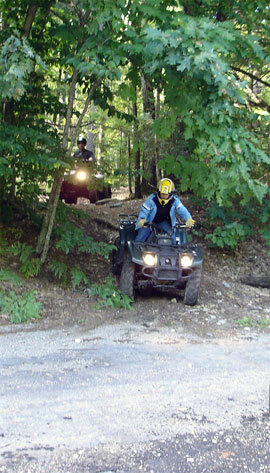 It is an offense to operate an OHV while under the influence of alcohol or drugs. Passengers on OHVs are not recommended. All components of the Off-highway Vehicles Act also apply. Location : Currently there are no accredited category B closed courses in Nova Scotia. Organizations wishing to operate a closed course must refer to “Designing and Maintaining Closed Courses in Nova Scotia”(340 Kb pdf) which outlines all mandatory requirements. An Application for Accreditation is found in Appendix C of the document above or download Application Form. All closed courses are operated by organizations accredited by the Minister of Natural Resources. Organizations must follow a precise set of guidelines established by the Department of Natural Resources that includes a full course inspection. The guidelines include specific requirements for the facility, users of the facility, safety, environment and noise control, and physical design characteristics based on facility type.